In a fit of nostalgia, I picked up one of these in a local second hand shop. We've had great fun blowing raspberries into it and playing back the results. We're classy. Back in 1984, samplers were ridiculously expensive, well beyond my student grant budget. So a bit of ingenuity was needed. My first solution was a Boss digital delay - it had a sample/hold mode that could be used to trigger a sample with the pedal. Ha! n-n-n-nineteen here we come. My next sampler was a great second hand shop find - an Oberheim Prommer, designed to create sounds for their DMX drum machine, but could be used a simple 8bit sampler in its own right. Now I could even play samples from a keyboard. From then on, everything I wrote had liberal use of the Orchestral stab - move over Trevor Horn. 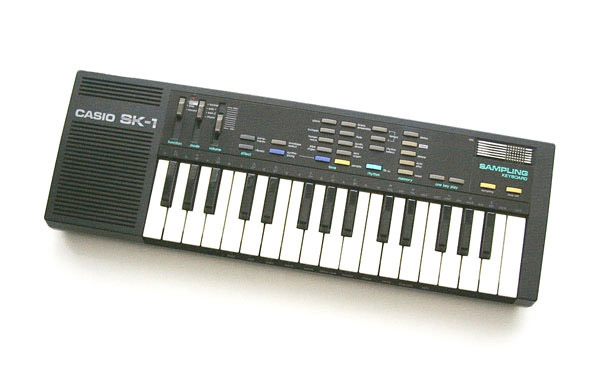 But the SK1 was the most exciting budget sample solution of them all - because it was polyphonic. We got to be dab hands at the following process - play an 'A' on a keyboard, and then sing the note, holding it as steady as possible. Sample it, and hit loop. Feed through primitive Tandy Reverb, and hey-presto, this etherial, distorted mellotron-like choir sound that I used again and again.